This built-tough outdoor blanket can handle adventures—or cozy snuggles on the couch. The outer shell is made of durable, water repellent rip-stop nylon that is surprisingly soft (and free of that crinkly sound). Inside is a stratofiber filling that insulates you, and compresses for easy packing. The queen size blanket’s curved edge provides more coverage, and there’s a buttoned pocket to keep toes extra toasty, too. Dimensions: 86" x 86" x 1"
It’s worth every penny! I bought two and we still fight over them! Super soft! The blanket is great! Very satisfied. 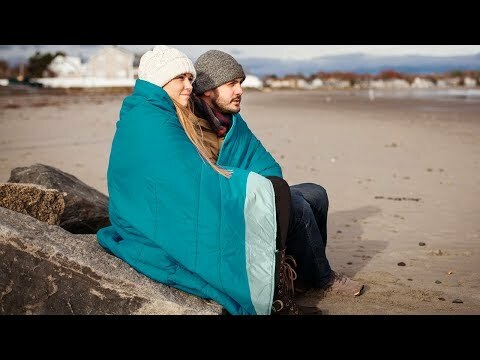 Stay cozy with an outdoor blanket that keeps you comfortable at a campsite or just curled up on the couch. 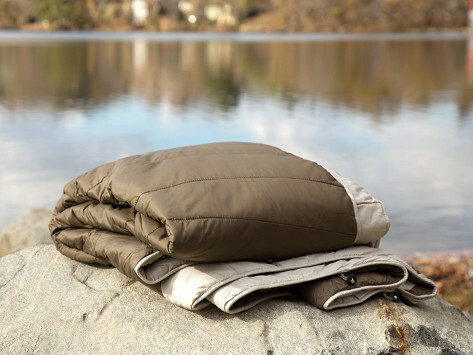 The Puffin Adventure Blanket is built to keep you warm, just about anywhere. It’s made from durable, water repellent rip-stop nylon that can handle the outdoors, but doesn’t feel like it—it’s surprisingly soft (and sans loud crinkly noises). The blanket's curved edge provides better coverage and there’s a buttoned pocket at the bottom just for toes to curl up in. Inside the blanket is stratofiber filling. It insulates similar to down, but is fluffier, and it compresses easily—so you can take the blanket wherever you want some cozy warmth.